Swindin: Remarkable. Quite remarkable. Remarkably remarkable! Steed: Would care to... remark on the remarkability? Run Time: approx. 156 mins. Review: For overall series review, click here. After viewing the The Avengers '68�Set 1, Volume 1 of this set, I was not holding out much hope for this second volume. Was I in for a surprise! This first episode is very fine piece of science fiction/espionage with murder being committed at the most secure facility in Britain. Members of the Ministry of Top Secret Information are triggered by a Manchurian Candidate-style telephone call to take on completely different personalities, notable for the claw-like clenching of the fist. A series of murders brings in our intrepid pair to investigate. I was so taken aback by how superior the writing and tone seemed to be in this episode, I went to The Avengers Forever site to investigate. Soon, I found myself deep into the intricacies and politics of Avengers' lore. It seems that there is much controversy over the classification of episodes during the production years in which Diana Rigg finished her run as Mrs. Peel and Linda Thorson was brought aboard as Miss King. It seems that this script was a leftover from the Rigg era and was reshot, at least partly, with Thorson. This quickly explained why Thorson here seems almost a doppelganger for Rigg. As the story unfolded in Split!, I was struck with thinking how difficult it must have been, especially at this advanced stage in the run, to come up with suspenseful stories week in and week out. Here it is managed nicely and I can see why the episodes on the first disc (later than this one in production) relied more on visual appeal and camp humor over quality of plot. The acting in Split! is very good with veteran British stage thespian Nigel Davenport as Lord Barnes and Julian Glover as Peter Rooke. Glover is a familiar face to movie-goers with a long career on television and in motion pictures. He had multiple appearances on Dr. Who and The Saint, as well as, The Avengers. Glover made appearances in such major films as Cry Freedom, For Your Eyes Only, Star Wars IV �The Empire Strikes Back and Indiana Jones and the Last Crusade. The production and set design is quite different in this episode and is very reminiscent of the early James Bond movies. There is almost always a wealth of small detail in the sets of The Avengers and it is well on display here. I raise three glasses of champagne on this one with Steed and Tara. Good show. I am always fascinated by shows from the 1960s that have computers because of the interesting ways that they present both the technology (real and imagined) and the ways that people of that era responded to the changes that computers were bringing to their lives. Not much of that here though, even though the title character is an "electronic brain," he doesn't do much in the show. Called George XR, the very amateurish-looking device is blasted with a shotgun in the first scene and the mystery ensues to determine the "whos and whys." There are "operations" on George that are quite absurd and, at one point, he manages to print out that his creator, Lord Pelly (Clifford Evans) is a traitor. The personification of the computer is particularly silly and adds little to the story, which is a somewhat typical "sniff out the traitor" plotline. However, the episode is redeemed by Miss King. Tara spends first part in a masked green costume and then, after a short stint in a surgical gown, appears in a smart little pink outfit. Alan Hughes designed the costumes for the Tara King character and her outfits are a continuing object of interest in these episodes. In fact, this particular episode is worth sitting through just to see the most excellent black number that Tara is wearing in the traditional Avengers' end piece with champagne. In addition, Thorson does a very amusing stint posing as the American niece of Lord Pelly and presents a very credible Yankee accent, probably very funny to the show's English audience. Linda Thorson Notes: She appeared on the American soap opera One Life to Live in 1989 through 1992 and appeared on Star Trek: The Next Generation in 1993 as Cardassian ship commander, Gul Occet, in the highly-regarded The Chase episode. Another redeeming factor is the action-side as Tara has a tough fight early on in the story and Steed makes interesting use of his bowler later. The show is reasonably well written (aside from the computer anthropomorphizing), and the suspense is helped greatly by the Tara aspects of the story. Although somewhat mixed, Tara prompts me to raise my (unexploding) glass more than twice. This episode starts off rather slowly, but soon picks up speed as Steed and Tara investigate an odd conspiracy involving black mail and the peculiar way that witnesses seem to reverse their testimony. As Steed pursues the people side of the plot, Tara has a chance encounter with a milk man that leads straight to the heart of the mystery, if only she can say what she "doesn't" mean. Tara has a new hairstyle for this episode, a short stylish cut as opposed to the bouffant seen in the previous two shows on this disc. Her costumes are not quite as interesting here, excepting the blue one with vest and shorts. Steed gets partnered temporarily with a suspect young agent named Melville (Barry Warren) who is somehow involved with the dastardly plot. The Mother character pops up here (although it is difficult to say exactly why) and this device is not one that adds a lot to the tried and true formula of The Avengers. Tara is still very much a "replacement" for Mrs. Peel in these episodes, but one must marvel at the consistency of Patrick MacNee. The comedy is restrained and stays nicely on this side of the camp line. I don't think I would be buttering up anybody if I said I liked this one and raise two glasses and sip. Image Transfer Review: All three episodes are nicely transferred with very little speckling and film noise. I did occasionally detect a greenish cast to the picture that must surely be source (perhaps some of the footage that was re-used in the switch from Peel to King). Imminently watchable however from beginning to end. Audio Transfer Review: The sound is very good Dolby Surround 2.0 and hit my speakers with a nice fullness. I was able to hear some nice sound effect design, particularly in the George XR episode. I am enjoying the sound work in both the music and effects more and more. Extras Review: There is nice teal menu design that captures the "pop" quality of the show. But, I can really do without music in the menu. As much as I like The Avengers theme, if I have the sound cranked up�hitting Menu can be quite a shock. Typical still gallery for these latest releases, meaning a few, poor, small pics. This is a cult collection, for gosh sakes, gives up some stuff! Where is my Tara King fashion gallery? The overall quality of this set is average with a mixed bag of episodes. 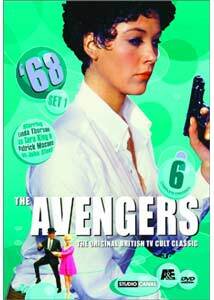 I have to say that someone wanting to add a little bit of post-Emma Peel Avengers to their collection could probably do worse, as this disc redeems the set in my eyes. In fact so much so, that I give the first of the '68 Avengers sets a full three glasses of champagne.